Researchers at Purdue University have created a magnetic “ferropaper” that might be used to make low-cost “micromotors” for surgical instruments, tiny tweezers to study cells and miniature speakers. Neah Power Systems, Inc., a company developing fuel cell based renewable energy solutions, reported that it has signed documents with CyVolt Energy Systems to acquire all of its technology and assets. The cost of the acquisition would be covered by the company’s recently announced financing that management plans to use to acquire businesses that are expected to provide positive cash flows in the near term. Neah intends to introduce the product, a hybrid fuel cell technology that recharges industry-standard lithium ion batteries, to the retail market within four to six months. Lithium ion batteries are the most common form of battery used in portable electronics. The product will produce ongoing power by “hot-swapping” additional fuel via cartridges or refills, thereby eliminating dependence on access to the electrical grid. Neah Power Systems, Inc. (OTCBB: NPWZ) is developing long-lasting, efficient and safe power solutions for the military, industrial and consumer applications, Neah uses a unique, patented, silicon-based design for its micro fuel cells that enable higher power densities, lower cost and compact form-factors. The company’s micro fuel cell system can run in aerobic and anaerobic modes. The company is developing energy generation and storage solutions based on its patented technology. Further company information can be found at www.neahpower.com. Kwon’s real-time, special acoustic resonant sensor uses micro/nanoelectromechanical systems (M/NEMS), which are tiny devices smaller than the diameter of a human hair, to directly detect diseases in body fluids. The sensor doesn’t require bulky data reading or analyzing equipment and can be integrated with equally small circuits, creating the potential for small stand-alone disease-screening systems. Kwon’s sensor also produces rapid, almost immediate results that could reduce patient anxiety often felt after waiting for other detection methods, such as biopsies, which can take several days or weeks before results are known. Networks composed of single-crystalline nanowires and nanoparticles of zinc and titanium oxides can form innovative photoanodes to enhance performance of dye-sensitized cells. While dye-sensitized cells have a 20-year history of development and are now competitive with their poly- and amorphous-silicon counterparts in overall cell efficiency and stability, quantum-dot approaches are at the very beginning of their functional exploitation and have thus far performed poorly. However, intense development efforts are aiming to enhance the overall photoconversion efficiency single-crystal nanowires of transparent conducting oxides into photoanodes. Pioneering work suggested the possibility of obtaining a photoelectrochemical system in which electronic transport takes place along the single-crystalline backbone of 1D transparent nanostructures (see Figure 1).3–6 Thanks to the high electron mobility in single-crystal nanowires (approximately 100 times higher than in a polycrystalline network), this solution eliminates the drawback of polycrystalline photoanodes, where a single electron must pass thousands of grain boundaries before reaching the anode (with high recombination probability). In principle, this benefit could result in unprecedented cell efficiency, but to date only limited results have been obtained for nanowire-based cells. Figure 1. Four different structures can be used as photoanodes in photoelectrochemical cells. (A) Polycrystalline network (traditional anode). (B) Polycrystalline nanotube. (C) Single-crystal nanowire array. (D) Network of single-crystalline nanowires and dispersed nanoparticles. One of the most critical issues is the very limited specific surface of the nanowire bundle, which affects the optical density of the active layer. Engineered networks of mixed polycrystal powders and single-crystalline nanowires can merge the beneficial properties of both systems. These networks allow high optical density of the active layer, which results in nearly complete light absorption while maintaining a direct electron path (which minimizes recombination processes).7 Such systems can be profitably applied in both dye- and quantum-dot-based solar cells. Figure 2. Scanning-electron-microscope images of three transparent conducting oxide materials integrated into photoanodes. (a) Traditional polycrystalline titanium dioxide (TiO2). (b) Zinc oxide (ZnO) single-crystal nanowire bundle. (c) Composite network of ZnO single-crystal nanowires and TiO2 polycrystals. We have fabricated different networks of transparent conducting oxides with different morphologies for use as photoanodes. We considered three different systems (see Figure 2), including polycrystalline (traditional) titanium dioxide (TiO2), single-crystal zinc oxide (ZnO) nanowires (1.5μm thick), and single-crystal ZnO nanowires mixed with polycrystalline TiO2 (1.5μm thick). The almost similar electronic band structure of ZnO and TiO2 guarantees perfect compatibility from the point of view of electron transport, limiting the formation of detrimental electric fields which could affect electron mobility. We sensitized photoanodes using the commercial ruthenium-based dye molecule N719 (Solaronix), and the triiodide/iodide (I3−/I−) redox couple. 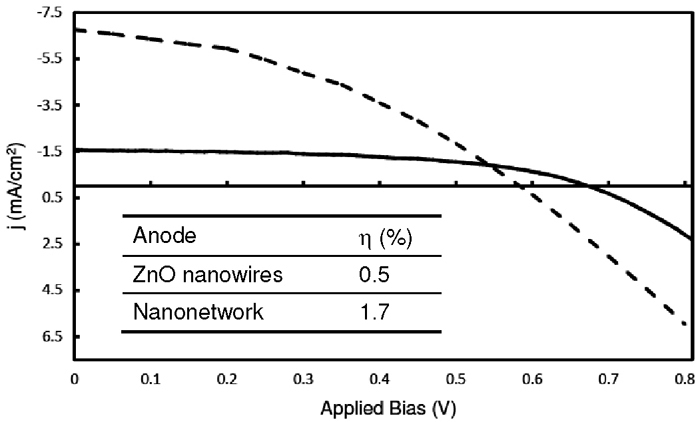 Comparison of current-voltage curves of cells composed of ZnO nanowires versus the composite network (see Figure 3) indicates that the latter enhances the short-circuit current and cell efficiency. Nanonetworks reduced open-circuit voltage, likely due to higher recombination in the TiO2nanoparticles than in single-crystalline wires. Figure 3. Current (j)-voltage curves of the dye-sensitized cells under 1 sun irradiation (airmass 1.5 global, 100mW/cm2). Solid line: ZnO nanowires. Dashed line: Network of ZnO nanowires and TiO2 nanoparticles. η: Efficiency. Our work demonstrates the effectiveness of composite nanonetworks in enhancing excitonic solar-cell efficiency. Optimizing the material improved network efficiency compared to a bare nanowire bundle. We hope to fabricate dye- and/or quantum-dot-sensitized cells with high efficiency by simply enhancing the thickness of the active layer, which is our next step. Cariplo Foundation, Program of Relevant National Interest (PRIN) 2007, National Institute for the Physics of Matter-National Research Council (INFM-CNR) seed project, and Greenvision Ambiente are acknowledged for partial funding. 1. M. Graetzel, Photoelectrochemical cells, Nature 414, pp. 338-344, 2001. 2. B. A. Gregg, Excitonic solar cells, J. Phys. Chem. B 107, pp. 4688-4698, 2003. 3. J. B. Baxter, E. S. Aydil, Nanowire-based dye-sensitized solar cells, Appl. Phys. Lett. 86, pp. 053114, 2005. 4. J. B. Baxter, A. M. Walker, K. van Ommering, E. S. Aydil, Synthesis and characterization of ZnO nanowires and their integration into dye-sensitized solar cells, Nanotechnol. 17, pp. S304-S312, 2006. 5. M. Law, L. E. Greene, J. C. Johnson, R. Saykally, P. Yang, Nanowire dye-sensitized solar cells, Nat. Mater. 4, pp. 455, 2005. 6. A. Luque, A. Martí, A. J. Nozik, Solar cells based on quantum dots: multiple exciton generation and intermediate bands, MRS Bull. 32, pp. 236-241, 2007. 7. A. Vomiero, I. Concina, M. M. Natile, E. Comini, G. Faglia, M. Ferroni, I. Kholmanov, G. Sberveglieri, ZnO/TiO2 nanonetwork as efficient photoanode in excitonic solar cells, Appl. Phys. Lett. 95, pp. 193104, 2009. Saes Getters S.p.A. (Lainate MI, IT) received U.S. Patent 7,663,865 for its electrolytic capacitors which contain getter materials for sorbing harmful gases and liquids created by the capacitors during their use. If gases such as hydrogen and carbon dioxide are not properly absorbed, the operation of the capacitor can be adversely affected. 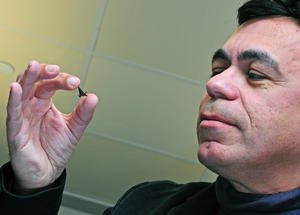 Carbon nanotubes are among the getter materials. Known electrolytic capacitors, e.g. EDLC supercapacitors (Electrochemical Double Layer Capacitor), are essentially comprised of an airtight housing, wherein electrodes typically formed of metal sheets are arranged, the electrodes being immersed in particular electrolytic solutions. The housing also contains gettering elements for sorption of substances harmful to the capacitors operation, and electrical contacts communicating the electrodes with the outside of the capacitor. The electrolytic solutions are typically formed of a solvent and an ionic salt. In the EDLC case, for example, acetonitrile and propylene carbonate are frequently employed as solvents, while tetraethylammonium tetrafluoroborate is often used as a salt. During use, these solutions can create harmful substances, often in gaseous form, which can damage the capacitors, possibly in an unrepairable manner. Another possible source of harmful gases can be due to the desorption of some materials used inside the capacitor. Carbon dioxide, carbon monoxide, and hydrogen are among the most harmful gaseous species; while water, which is another particularly harmful species, is typically present in liquid form inside the electrolytic solution. The problem of the sorption of harmful species inside the capacitors can be tackled by adding one or more sorbing elements mixed in the electrolytic solution, or by non-mixed sorbing systems. The use of materials with a gettering action mixed in the electrolyte can be accomplished by liquid sorbers. Saes Getters’ device is made of a multilayer polymeric sheet, which is formed of an inner layer of polymeric material, containing particles of one or more getter materials for sorption of the harmful substances, and at least one protective layer of a polymeric material impermeable to the electrolyte. All of the polymeric materials are permeable to the harmful substances, say inventors Luca Toia and Marco Amiotti. The getter material is at least one selected from non-evaporable getter alloys, unsaturated organic compounds, zeolites with a silver deposit, carbon nanotubes, palladium oxide, and cobalt(II,III) oxide; when the harmful substances comprise H2O, the getter material comprises at least one compound selected from alkaline-earth metal oxides, boron oxide and zeolites; and when the harmful substances comprise CO, the getter material comprises at least one compound selected from the following: cobalt(II,III) oxide, copper(II) oxide and potassium permanganate.